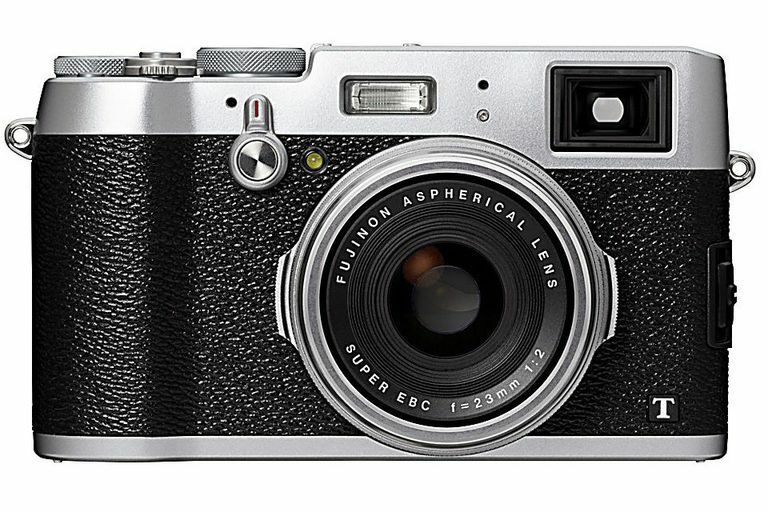 The Fujifilm X100T has a variety of dials you'll use to control the camera's settings. Although Fujifilm cameras are reliable pieces of equipment, you may experience problems with your camera from time to time that don't result in any error messages or other easy-to-follow clues as to the problem. After all, they are pieces of electronics that can experience problems. Troubleshooting such problems can be a little tricky. Use these tips to give yourself a better chance to fix Fujifilm camera problems. If you shoot a photo where the subject features a prominent checkered pattern, the image sensor can mistakenly record a Moire (striped) pattern over the top of the subject pattern. Increase your distance from the subject to minimize this problem. Make sure you're using Macro mode with your Fujifilm camera. You may have to experiment a little bit to see just how close you can be to the subject, even in Macro mode. Or read through the camera's specification list to see the minimum focusing distance you can use in both regular shooting modes and macro modes. Make sure all of the metal contact points on the memory card are clean; you may use a soft, dry cloth to gently clean them. Make sure the card is inserted in the camera correctly. Finally, you may need to format the card, which will erase any photos stored on the card, so only use this as a last resort. Some Fujifilm cameras cannot read a memory card that has been formatted with a different brand of camera. If when using your built-in flash unit on the Fujifilm camera, you're finding that backgrounds are underexposed, try using Slow Synchro mode, which allows more light to enter the lens. However, you'll want to use a tripod with Slow Synchro mode because the slower shutter speed may cause blurry photos. A Night Scene mode also will work well. Or with some advanced Fujifilm cameras, you may be able to add an external flash unit to the hot shoe, giving you better performance and more features than a built-in flash. In certain situations, your Fujifilm camera's autofocus system may have trouble focusing properly, including when shooting subjects through glass, subjects with poor lighting, low-contrast subjects, and fast-moving subjects. Try to avoid such subjects or re-position yourself to avoid such situations or minimize the impact of such situations. For example, position yourself to shoot a fast-moving subject as it moves toward you, rather than as it moves across the frame. You can reduce the effects of shutter lag by pressing the shutter button halfway down a few seconds before shooting the photo. This will cause the Fujifilm camera to pre-focus on the subject, which reduces the overall amount of time needed to record the photo. Try turning the camera off and removing the battery and memory card for 10 minutes. Replace the battery and memory card and turn the camera back on again. If that doesn't fix the problem, the camera may need to be sent to a repair shop. Advanced Fujifilm cameras, both fixed lens models and mirrorless interchangeable lens cameras (ILCs), have a variety of methods for changing the shutter speed and aperture settings on the camera. Some models of Fujifilm cameras allow you to make the changes through the on-screen menus. Others require that you twist a dial on the top of the camera or a ring on the lens, such as the Fujifilm X100T. It can be a little difficult to figure out some of the dials from model to model, so you may want to keep the user guide handy.